The United States is a safe haven for persons who have been persecuted or have a well-founded fear of persecution on account of race, religion, nationality, membership in a particular social group, or political opinion. 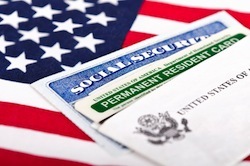 The U.S. extends protection to eligible foreign-born nationals by providing a pathway to permanent residency and citizenship through two programs: refugee resettlement program and asylum program. If approved, receive a medical exam, cultural orientation and loan to travel to the U.S. The USRAP is an inter-agency effort of governmental and non-governmental partners. The first point of contact is with the local staff of the United Nations High Commissioner for Refugees (UNHCR) which screens and interviews a person wo claims persecution or danger of future persecution. In the absence of local UNHCR, there are non-governmental organizations that are also authorized to make referrals to USRAP. File an asylum application within 1 year of arrival in the U.S.
Rights/ Benefits - Bring spouse and children to the U.S.
- Apply for U.S. citizenship after four years of permanent residency - Bring spouse and children to the U.S.
*Condensed process for illustration purposes only. Not intended to be an exhaustive legal discussion of the admission process. Our firm recognizes the need to extend legal assistance to the most vulnerable individuals. For this reason, our attorneys handle a number of asylum and refugee cases. If you believe that may qualify to obtain asylum status in the U.S., feel free to ask any questions and we will reach out to you. The success of an asylum application depends primarily on documenting the case. The role of an attorney is vital in communicating your story to the adjudicator and helping you obtain asylum status. D&A focuses on Asylum and Refugee cases on a very individualized basis. Our Asylum and Refugee Practice attorneys will engage you on a very personal level in the preparation and representation of your claim. At D&A, we can provide assistance making referrals for expert witnesses and testimony, including experts on country conditions in your country of origin, as well as a medical and psychological expert who can provide evaluations to corroborate evidence of maltreatment. The grant of asylum is a matter of discretion and the interview is crucial in establishing your claim. D&A can guide you step-by-step on what to expect during the interview. You may be represented by counsel during the interview provided there is no expense to the government. During the interview, we may present evidence relevant to your claims (i.e. persecution, torture) and present a statement at the end of the interview to solidify your asylum claim.